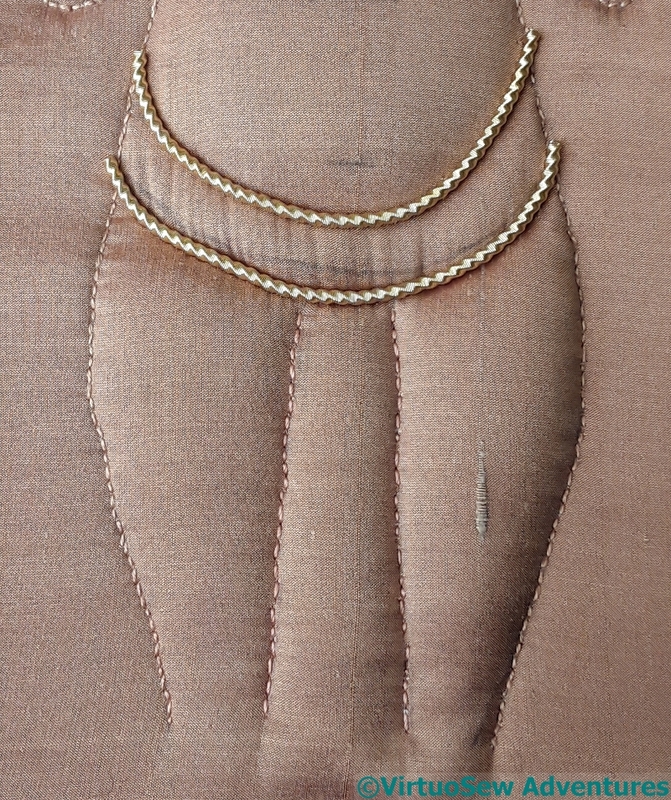 While I mull over the gold section of Akhenaten’s headdress, I’ve decided to work on his loincloth and belt. The original inspiration here was for the silver purls to represent the pleats of the loincloth, but when I talked with Sarah at Golden Hinde, when I was buying all the wonderful metal threads, she suggested that I should probably do the belt and fall first, not least, to have somewhere to tuck any untidy ends of the purls while I’m still getting the hang of it! 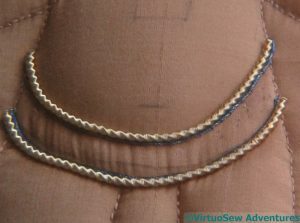 So I started with a very large gold purl with a sort of twist on it, and settled it neatly into the stitching lines from the quilting. That was followed by a slightly iridescent blue twist. It’s going to be tricky to keep that as visible as I want it to be, and I may very well end up playing around with the placement, or even removing and reinstating it later. Tha purl has a lovely twist, but I think it looks even better when offset against the blue. Will you add another line of blue to thicken the line? The blue twist is a lovely touch. Ah, a place to stash the thread ends! Good thinking. I like the blue twists. How about whipping the blue with more blue? That is a great idea from Sarah – and is why talking to others is such a good idea. I really love your blue twist too – it really adds a lovely dimension to it. It sounds like the blue was a winning move! Looking forward to seeing how this develops. Love the touch of blue. You always do such interesting work, the belt is looking good. 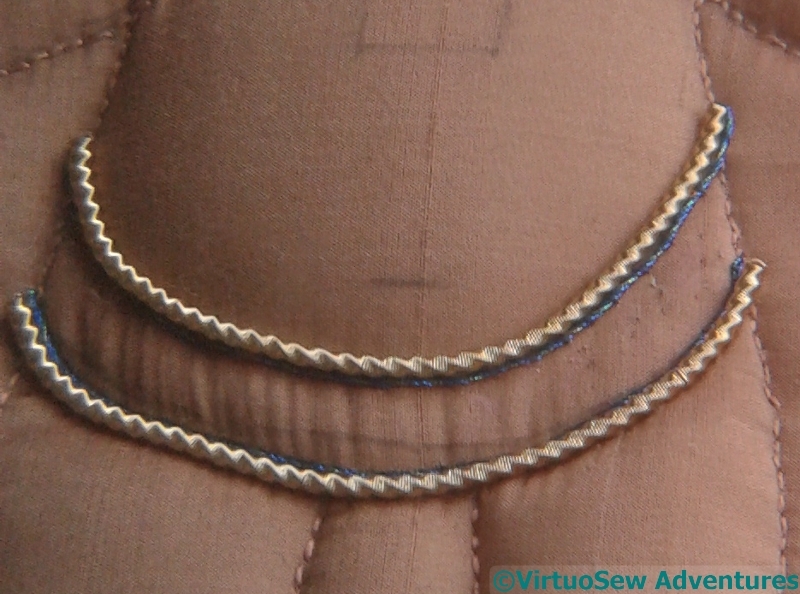 I don’t know enough about goldwork to suggest how to make the blue more visible. Pehaps a line of slightly darker blue silk between the two purls would give a hint more colour to the blue one and add a little breathing space? Love that touch of blue. It will be intersting to see this all come together. then purl is beautiful….I have every faith in you making the blue work, if anyone can do it it’s you. I like the blue and the gold, but looking at it close-up, that’s a lot of work you’ve done already, and I know there is more to go. I’m amazed at how much you put into these pieces. Your patience must, at times, be tried! In the end, you always have something that’s truly beautiful and worth the time it cost.